Anyone who uses Steam knows that games in Greenlight aren't always of the highest quality. But from time to time, something very interesting appears out of the oozing verdant mass to grab the community's attention. 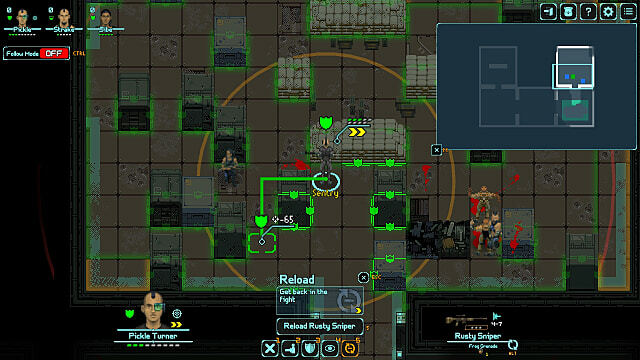 Depth of Extinction, a 2D turn-based tactical RPG from HOF Studios, is one of those rare finds. After spending some time in development, the game garnered enough votes to make it to Steam's front page -- and as of this writing, is one of the platform's top sellers. And with good reason: while Depth of Extinction might not be perfect, it's a fun throwback to old school classics like X-COM. 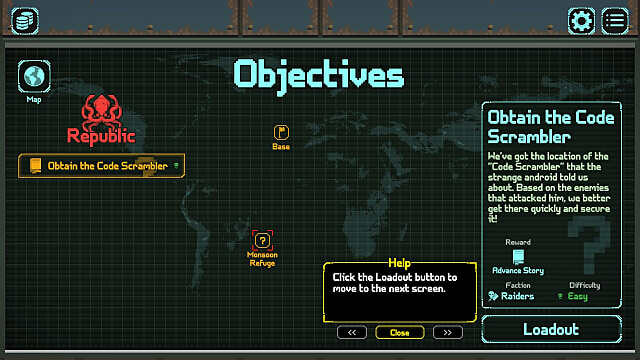 Depth of Extinction is set in a post-apocalyptic world, where the remnants of civilization have managed to survive on small bases scattered all over the world. Since most of the Earth has been flooded by a cataclysm, your squad moves between locations in a submarine, which is an interesting touch in a genre filled with space ships. The world map is divided into five sectors, all of which correspond to different factions. On top of that, each sector contains several major locations, each of which consists of smaller bases that serve as mini-maps. This is where all the events take place. Your squad arrives at one of the chosen maps, raids it for loot, and moves on to another one. Main points of interest keep you pointed in the right directions, guiding you down the optimal path for story-based items. To get them, you'll go through a chain of intermediate mini-maps. However, the game allows you yo choose the path on your own, as well, so you can make your journey shorter or longer depending on your needs. For example, if you need money, weapons, or healing items, then you ought to raid as many bases within the game's major locations as possible. Depth of Extinction will even suggest that you either skip certain locations or quietly observe them without interfering, while others state clearly that you can enter, kill a bunch of enemies, and take all that you can find. This makes selecting your path to the main objective a lot of fun in most regards. Unfortunately, the mini-maps themselves aren't as exciting; the design of each is great, but the actions you need to take are all basically the same over and over again. Before setting out on missions, the game asks you to choose your loadout. It includes the submarine you want to take on your journey and the squad that will accompany you on your mission. To get you started, you'll get a relatively good amount of funding, which is enough to buy a basic submarine and add one extra member to your squad. From there on out, it's up to you to keep things running and your crew manned. Each squad member has their own perks and specialties, but in the beginning, it doesn't really matter who you choose. The further you progress through the game, you will be able to meet Merchants, NPCs that can provide you with extra equipment. 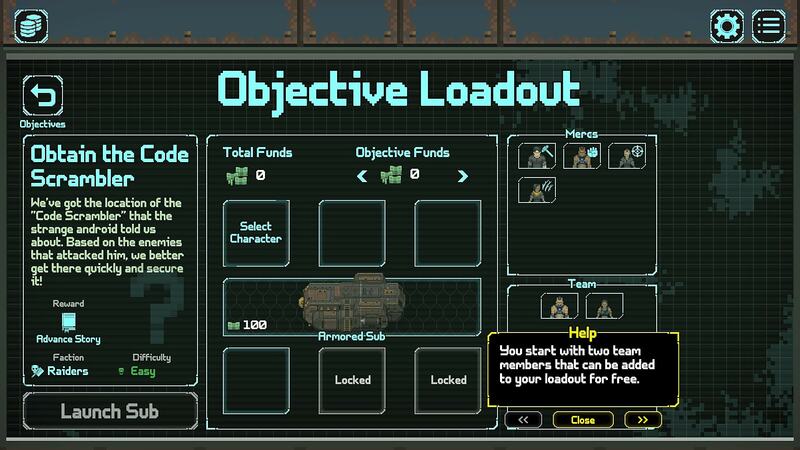 Although you'll get loot from looting bases, the really good items come from spending mission money at the Merchant to get the really good stuff that'll help you deal with more powerful enemies and bosses. When you arrive at a base, your team moves in turns. 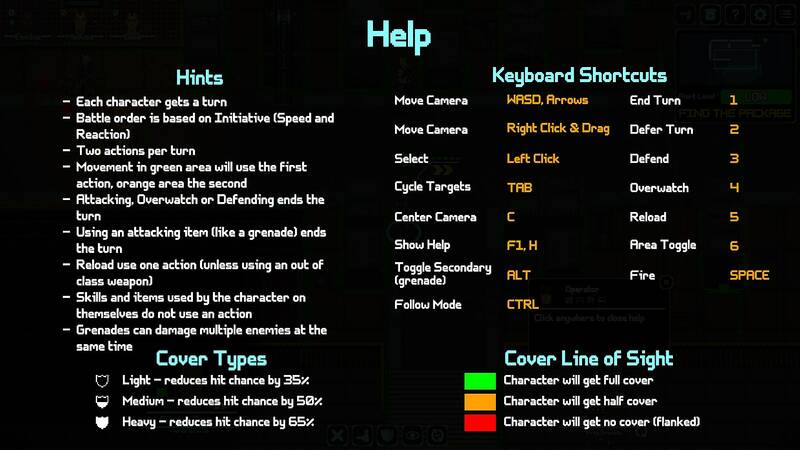 If you spot an enemy, you can start shooting immediately. However, positioning squad is very important, and you need to enter each map with certain tactics and strategies in mind. Just as it is in other tactical games like X-COM, it's important to keep your squad behind cover as much as possible. It's also important to the range of your currently equipped weapons. For example, it's wiser to position a sniper further away from the enemy and a shotty much, much closer. To get a better idea of what this is like, you can easily compare the game's shooting mechanics to those in Wasteland, where you see hit chance when hovering your mouse over the enemy. 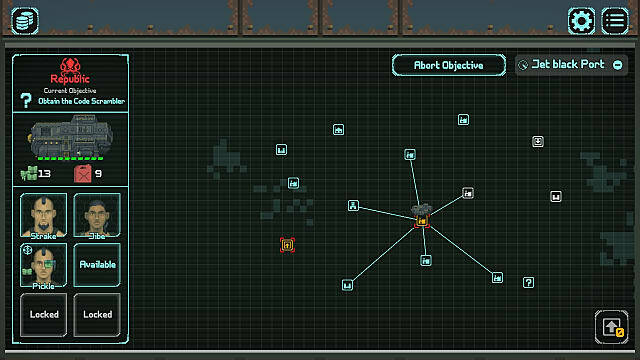 Mercing enemies is made easier seeing as the controls are very simple and intuitive. Although the process can be a bit clunky in the beginning before you learn all the hotkeys, the mid- to late-game runs really smooth. The only real downside is that there isn't much variation here. Perhaps the game will see a few post-release patches to increase tactical diversity, but as it stands, you'll us the same strategies to win time and time again -- even against Depth of Extinction's harder foes. Like I said in the beginning: Depth of Extinction isn't perfect, but it's got a lot of good things going for it. The game's visual and audio presentation are great. The soundtrack is especially cool, and it plays in the vein of 80's synthwave, which really strengthens the overall vibe; it perfectly fits the 2D setting of the game with its industrial design. Nothing really distracts you from the gameplay in this regard, which means that the developers paid a lot of attention to the details. The downside here is that although the gameplay is fun, it does get a bit boring if you play for longer sessions. You basically repeat the same actions without much variation. But if you're a fan of old-school turn-based games, then you will enjoy the hell out of Depth of Extinction. So at the end of the day, it's all a matter of perception and taste. 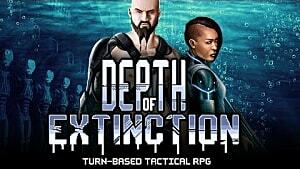 Depth of Extinction is a fun throwback to old-school tactical RPGs like X-COM and Wasteland -- even it it's ultimately held back from glory by a few missed opportunities.